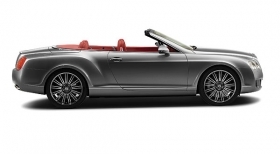 Bentley today unveiled a more powerful version of its Continental GTC convertible aimed at attracting younger buyers to the luxury marque. The new Continental GTC Speed will debut at the Detroit auto show next week as the most powerful Bentley convertible ever. Its twin-turbocharged W12 engine delivers 600 bhp -- 9 percent more power and 15 percent more torque than the standard GTC -- and can reach 200 mph with the roof up. The GTC Speed rounds out the family of Continental Speed models begun by Bentley in 2007 with the introduction of the GT Speed coupe. The four-door Continental Flying Spur Speed followed last summer. The GTC Speed will go on sale this summer as a 2010 model year. Bentley expects it to account for up to two-thirds of GTC sales worldwide in its first year of production.